Although these three musicians know each other from different projects, it wasn’t until the end of 2013 when this trio was born. The reason of this combination was Risco’s desire of putting together the singular sound of vibes and organ in a group that were as small as autonomous, emulating the tandem of Joey DeFrancesco & Bobby Hutcherson. The result of that is a sound with the traditional touch of the trio, but with a cool sound, calling the attention of audiences in festivals and clubs in Spain and Portugal such as Imaxinasons, Percursos da Música (Ponte de Lima, Portugal) or Ciclo 1906 Jazz. The repertoire, contained in their first CD “Ginger Lemon and Honey” (FreeCode, 2015), moves between originals and standards using the most intimate sonorities, mixed with groove and up tempos. 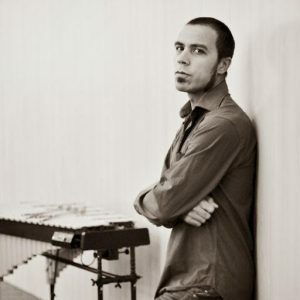 Educated in classical and jazz, his eclectic character leads him to collaborate with a broad range of artists like Metropole Orkest (Amsterdam), Vince Mendoza, Kenny Werner, Asko Ensemble (Amsterdam), Paul Hillier and Theatre of Voices, Galician Jazz Orchestra, NARF, Timbila Muzimba, Cristina Pato, X. Manuel Budiño, Nova Galega de Danza, Iago Fernández, Roberto Somoza, Paco Charlín, Víctor Prieto Trío, LAR Legido, Marcos Pin Factor E-Reset, Jacobo de Miguel, among others. Iago Fernández was born in Cangas in 1987. He started his musical studies on percussion at the conservatory of his town with teacher Luís Carballo. His first contact with jazz was in the “Seminario Permanente de Jazz de Pontevedra (SPJP)” tought by Abe Rábade and Paco Charlín, studying four years including master classes and concerts with international artists. In 2005 and 2006 he went to “Tavira Workshop” (Portugal) taking lessons from Tony Moreno, John O’Gallagher, Allan Ferber, Dave Phillips, Rez Abasi, Russ Johnson and Russ Lossing. In august of 2009 he went to the “Begues Jazz Camp” to take lessons from Ben Street, Mark Turner, Jorge Rossy, Ben Monder and Michael Kanan. After four intens years, in 2011 he is graduated with honors in the “Centro Superior de Música del País Vasco, Musikene” (jazz drums speciality) where he take lessons Jorge Rossy, Perico Sambeat, Jo Krause, Albert Sanz, Guillermo Klein and Chris Kase among others. He played in the best festivals of Spain: Getxo, Badajoz, Ibiza, Barcelona, Vigo, Madrid, Mallorca, Pontevedra, Valencia, Salamanca, Lugo, San Sebastián , Las Palmas. 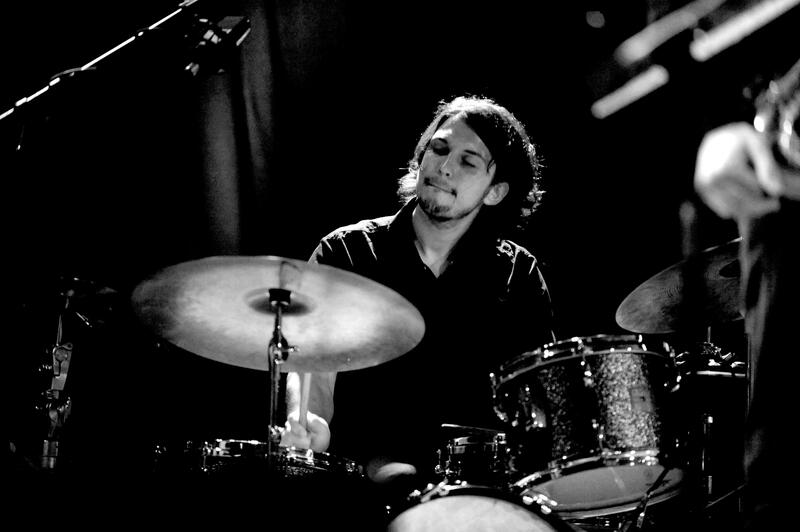 Also in Ecuador, Germany, Denmark, France, Italy and Portugal (where he work a lot), with musicians as: Avishai Cohen (trumpet), Omer Avital, Perico Sambeat, Marcus Strickland, Lage Lund, Masa Kamaguchi, Javier Colina, Albert Sanz, Chris Kase, Jorge Rossy, Guillermo Klein, Andrzej Olejniczak, Logan Richardson, Bob Sands, Cecilia Coleman, John O’Gallagher, David Virelles and Petros Klampanis among many others. In addition to having recorded about twenty works as a collaborator, Iago has three albums as a leader: “Agromando” (2011), “Acougo” (2015) and “Brisa” (2016). Alex Salgueiro (A Estrada, Galiza), begins with the flute at the age of 8 self-taught, as a member of the “Banda Cultural de Teo” and for 14 years of the “Banda Municipal de A Estrada” as principal flute. He ends his bachelor of music in A Coruña with honors in the specialty of flute. He also attends to master classes with teachers like Will Offermanns, Jos Wuytack, Jorge Caryevschi among others. As an active sideman, he plays with numerous groups, either in the classical field (Aula de Cámara, ExperimentaDanza, “Macuf”, etc.) and the popular field (Matina Folk, A Matraca Perversa, Galegoz, etc). 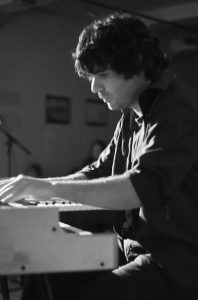 After graduating in flute he begins modern piano studies at the “Escola Estudio” and the “Seminario Permanente de Jazz de Pontevedra” with the teacher Paco Charlín. Soon he began collaborating with great musicians in the jazz scene in Spain. As keyboardist collaborates with the pop group “Immaculate Fools” and the formation of experimental music “Chanzo”. 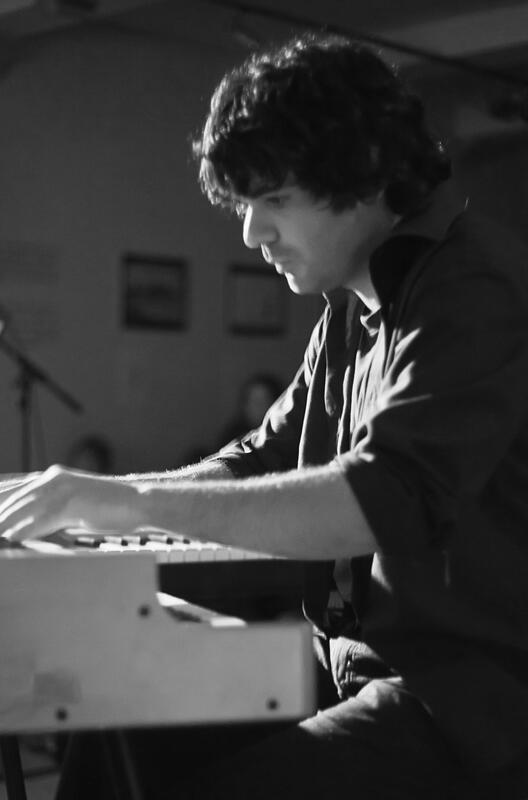 The Hammond organ is the instrument that has focused the study and activity collaborating with formations such as “Ton Risco trío”, “Juzz”, “Felipe Villar organ trío”, etc. Currently, besides being an eclectic musician and a busy sideman, he is a flute teacher at the conservatory and conducting soundtrack in the audiovisual field.